Salt or sugar, blended or on ice—however you take your margarita, these bars and restaurants in Wisconsin serve up the very best! Pair it with a spicy Mexican dish, and you have yourself a night. Tequila-loving Wisconsinites rejoice and enjoy these 10 places for a great margarita in the state! At Eldorado Grill you’ll find a casual Mexican eatery with some of the best margaritas in the area. Enjoy a classic Eldorado margarita with 100 percent agave tequila, a fresh squeezed lime, and Patron. They have over 130 tequilas and mescals on their menu! If it’s got margarita in the name then you know it’s got to be good. Order authentic Mexican dishes—but don’t forget to pair it with a large margarita. Happy hour is Monday-Friday with various times. Enjoy over 50 margaritas flavors at Margarita’s of Green Bay! There’s nothing better than good margaritas. Enjoy hand shaken margaritas served tableside. Their authentic Mexican dinners pair perfectly with a refreshing margarita. Order with or without alcohol or a superb taste all around. Find locations in Appleton, Menasha, and Neenah. Belair Cantina prides themselves on being Mexican, but with a California flair. They are most widely known for their tacos and tequila. So naturally their margaritas are top notch. They’ve got six area locations in Wisconsin. Stop by and taste the California pizzazz today! The Madison areas loved Laredo’s Mexican Grill so much that they added five locations for even more margarita sipping fun. All food and drinks are made with the highest quality ingredients. They’ve got four House ‘Ritas, 10 Specialty ‘Ritas, and a ton of other Beach Drinks. Choose to add premium liquor in your margaritas or if you love tequila—try their tequila flights! While there might not be a ton of margarita flavor options at La Carreta—it’s the best margaritas in Manitowoc. Choose from lime, strawberry, mango, or peach. Ask for your margarita on the rocks or frozen in a variety of sizes. Casa Margarita concocts some of the best margaritas in Eau Claire. If you’re looking for great service, food, and an ice cold margaritas then Casa Margarita is the place to be. Stop by on Mondays for 99-cent margaritas—you can’t beat that price! For those who love margaritas—you need to try Margaritas City in Oak Creek. Drinks, food, fun, in that order. There are margarita specials all week long. Stop by Monday, Thursday, Friday and Saturday for two for one margaritas. It’s always margarita time at Margarita City. If you’re looking for the best margaritas in Platteville Fiesta Cancun is the place to be. Get authentic Mexican food, great service, and even better margaritas. Enjoy margarita drink specials all week long at Fiesta Cancun! Pasqual’s is another Madison favorite for Mexican and margaritas. 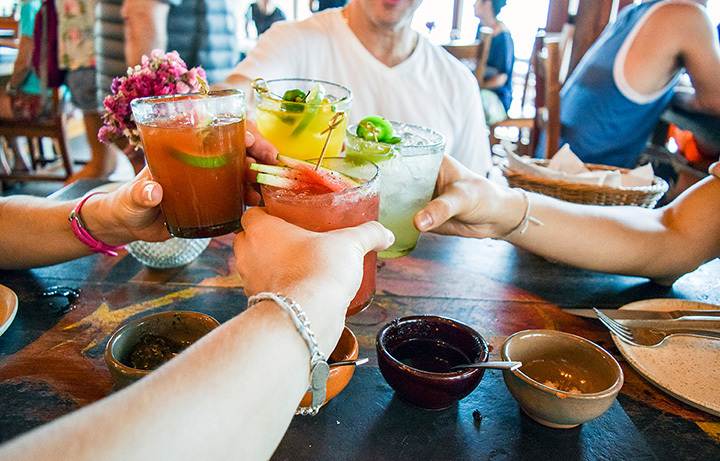 Enjoy three locations for even more margarita lovin’ fun. Stop by on Tuesdays for half priced margaritas. Choose one of their signature margaritas or build your own.